Ninety-nine homes destroyed in last year’s flooding have been approved for buyouts by the state. The approval is one step in the federal hazard mitigation program. Now FEMA will review the applications. That process is expected to be completed next month. The FEMA hazard mitigation program allows towns to apply for the buyouts on behalf of people whose houses were destroyed. The applications go first to the state. Ray Doherty is Vermont’s hazard mitigation officer. Doherty says 99 homes in 34 towns have been approved for buyouts by the state committee. Thirty to 40 percent of those homes were destroyed in spring flooding. The rest were casualties of Tropical Storm Irene. The applications now go to FEMA. Doherty says the agency normally approves the buyouts that the state has recommended, and the process should be completed sometime next month. There are several reasons for the discrepancy between the estimated number of homes destroyed in the floods and the number approved for buyout. "Invariably in every disaster there’s disparity in numbers," Doherty said. "There are initial estimates of maybe 200 and some odd homes or more. Very often a lot of those estimates are off. I’m confident that the majority of the severely damaged homes are being covered by this buyout program." Doherty says in some cases homeowners decided they weren’t interested in the buyout program. Also, mobile homes made up a disproportionate number of the dwellings lost in the flooding and they didn’t generally qualify for the buyout program. Nearly all of the applications received were approved by the state hazard mitigation committee, but several are in limbo because they may not meet FEMA guidelines. Doherty says the committee is working to see if FEMA will still consider those applications. Under the hazard mitigation program FEMA pays up to 75 percent of the home’s value. 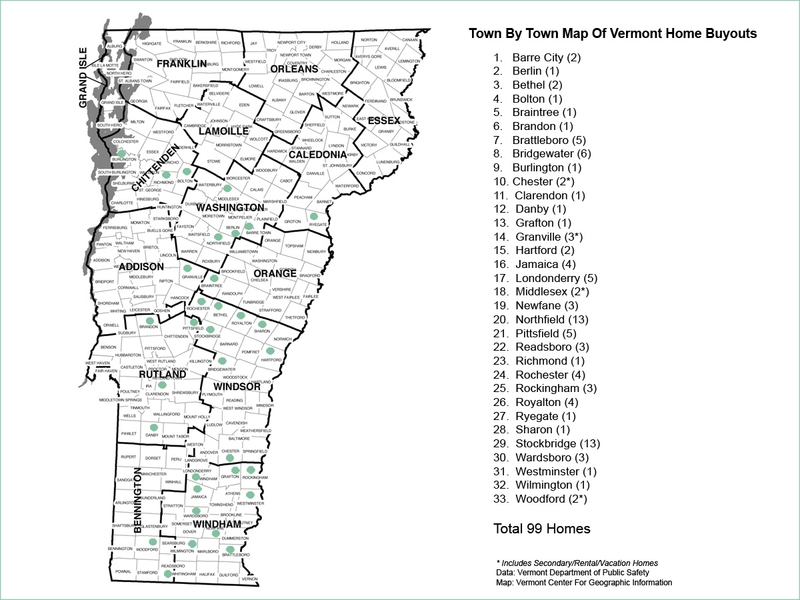 It’s likely that the remaining 25 percent will be made up from a federal grant and the Vermont Housing Conservation Board. According to Doherty, "It’s still in process and there are a lot of factors involved. We like to think that in terms of the buyouts, folks will receive close to 100 percent of the pre-disaster assessed value." Once FEMA approves the buyout and pays the homeowner, the land becomes the property of the town and can’t be developed again. 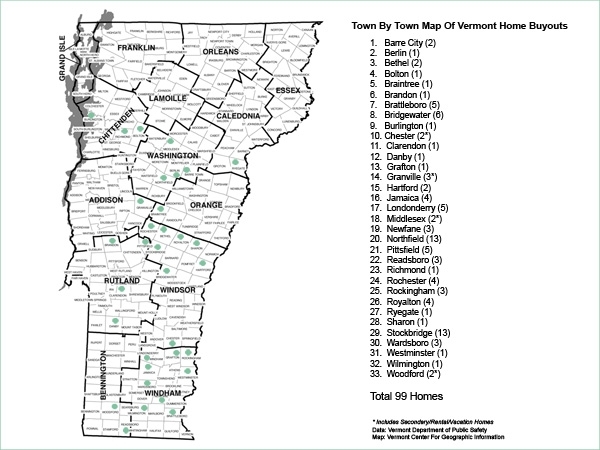 Here are the towns where the 99 homes are located: Barre City, Berlin, Bethel, Bolton, Braintree, Brandon, Brattleboro, Bridgewater, Burlington, Chester, Clarendon, Danby, Grafton, Granville, Hartford, Jamaica, Londonderry, Middlesex, Newfane, Northfield, Pittsfield, Readsboro, Richmond, Rochester, Rockingham, Royalton, Ryegate, Sharon, Stockbridge, Wardsboro, Westminster, Wilmington, Woodford and Woodstock.